Welcome to our website. We're a non-profit organisation located in Narón, in the northwest of Galicia, Spain. Our mission is to teach, promote and share music from all genres in our town and our region. The Association manages a Music School and three Music Ensembles formed since 1994, with the support of the of our associates and the local government. The Association manages a Music School whose objective is teaching music to people of any age. The plan the School offers is adapted to different ages and musical experience of the student, from newcomers to experts. Some teachers give a non-conventional approach to music to children aged 5 and 6. With 6 or 7 years, kids are encouraged to choose an instrument, and they begin their music theory and instrument classes. Adults with or without experience in music are welcomed as well to study in our school. The association owns several instruments that are lent to the students who request one. Both the School and the Bands share the objective to spread and promote the music culture to all over our territory. 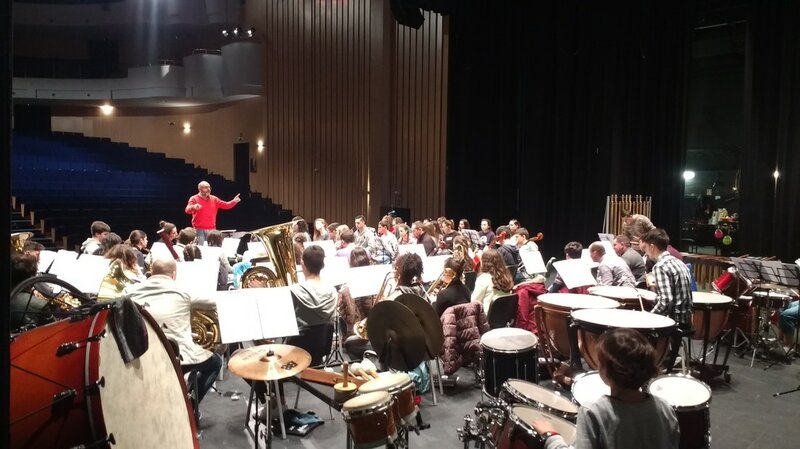 The main objective of the School is to train musicians to take part, eventually, in the Music Ensembles of our Associacion: Banda Infantil de Narón, Xove Banda de Narón and A Banda do Garaxe. The youngest musicians of our School, when their teachers consider they have achieved certain degree of autonomy are invited to the rehearsals and concerts of our Children Band (Banda Infantil). They take part in some local performances, and participate in some activities -like concerts or summer camps- out of town. The participation of keen newcomers is always welcomed, and, although most of the musicians come from our School, new people joins the Youth Band, creating a great and diverse ensemble. In November 2016 a new musical project named A Banda do Garaxe was created. Its objective is to play music in smaller places than our bands usually perform. There are twelve musicians from our Bands in A Banda do Garaxe and their music is based in arrangements of modern pieces and songs, with a very festive repertoire. Its name and music come from the Garage Rock stream, born in the sixties in USA; where teenagers used to meet in garages to play music with the passion and energy, the very base of the Rock music for lots of people. During the summer of 2017 they have had several concerts across the region, in urban events or some sporting events like the Pantín Classic in Valdoviño.